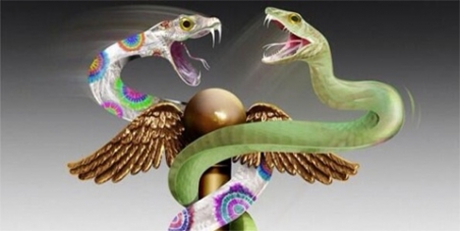 How False Constructs Come to Be Regarded As Irrefutable Truth: The “Disruptive Physician”, Addiction Medicine Specialists and the 21st Century Inquisition of Doctors–Let’s See if She Floats! Written by the PHP doctors for PHP doctors, the disruptive physician construct came to be regarded as irrefutable truth and contributed to the identification and removal of an undetermined number of medical doctors. 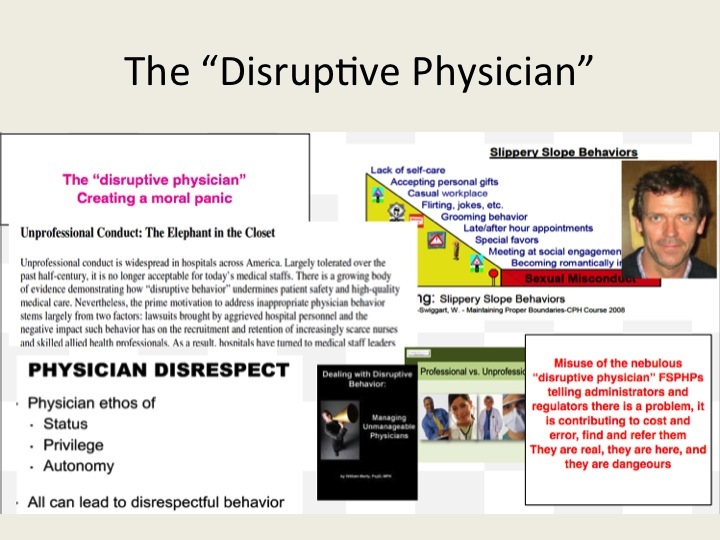 Although there was a general belief in “disruptive physicians” at the time of this call to arms they were not regarded as evil or life threatening. Society did not fear them and hospital administration and regulatory medicine did not feel the need to hunt them down. 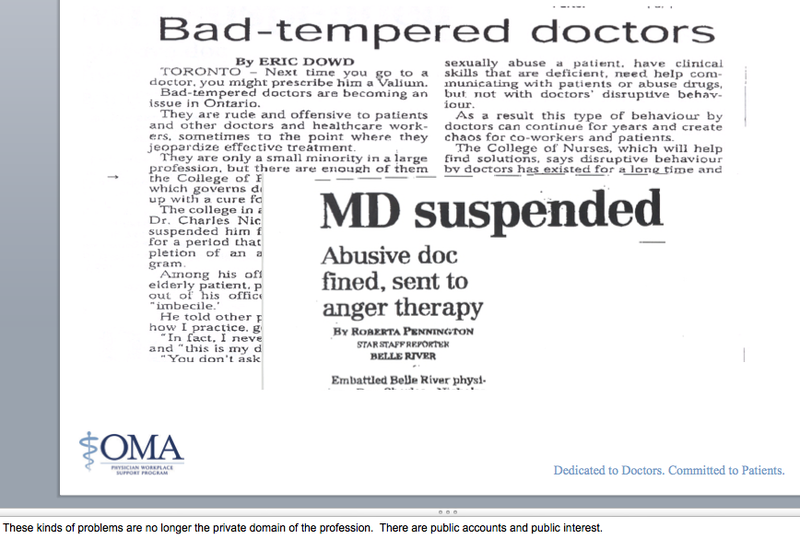 There were many scholars who publicly doubted this epidemic of disruptive physicians at the time. That would soon change. From the mid 1980s until present day a confederacy of “authorities” calling themselves “addiction medicine” specialists assisted in identifying disruptive physicians. Shaping clinical and legal orthodoxy they set the standards that cooperating regulatory authorities could follow in criminalizing, persecuting and punishing heretics. During the state PHP “disruptive physician” with-hunts the legal notion of crimen exceptum (an exceptional and most dangerous crime) allowed for the suspension of normal rules of evidence to punish the guilty. Because of the nature of the enemy the evidentiary bar was lowered and any witness, no matter what his credentials, could report a doctor to the state PHP. The consequences of being branded a heretic by questioning the existence “disruptive physicians” essentially silenced any dissenting voices and the notion of crimen exceptum freed the consciences of those involved. Through the “disruptive physician” trials clerics, “addiction medicine” specialists, psychologists, neuropsychologists, commercial drug-testing labs, assessment and rehabilitation facilities and lawyers used their expertise as witnesses to increase their prestige. The “disruptive physician” developed into a means of economic profit. Some gained a lot of money from the “disruptive physician”. The accused doctor and his or her relatives paid out of pocket for those who worked the “disruptive physician” trials including those doing the testing, assessment and treatment. “Witch hunting,” wrote the historian Rossell Hope Robbins, “was self-sustaining and became a major trade, employing many people, all battening on the savings of the victims.” So too is hunting the “impaired,” “disruptive” and “aging” physician and the costs are usually paid by the accused. Their property was lost to pay the revolving door of testing, assessment and treatment and those overseeing it raked in increasingly large sums of money as well as other reliable assets. A doctor accused could easily be ruined permanently. And in 2015 nothing has changed. Cunningham GM. Editorial: The Dreaded Task of Confronting Disruptive Physicians. Journal of Medical Licensure and Discipline. 2004;90(2):6-7. Summer GL, Ford CV, Lightfood WM. 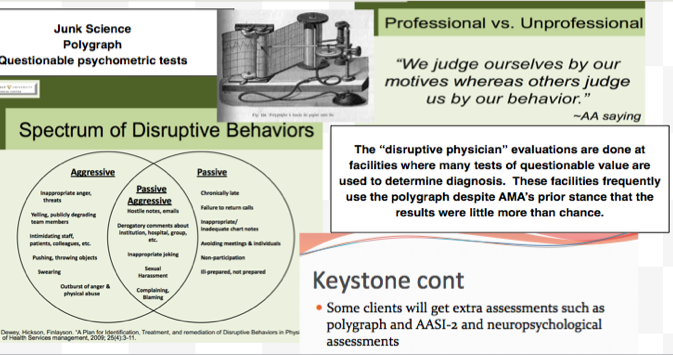 The Disruptive Physician, I: The Alabama Physicians Recovery Network. Federation Bulletin. 1997;84(4):236-243. Bohigian GM, Bondurant R, Croughan J. 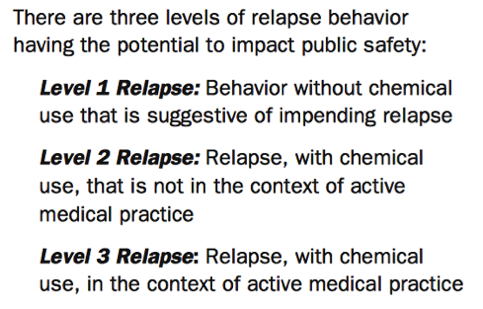 The impaired and disruptive physician: the Missouri Physicians’ Health Program–an update (1995-2002). 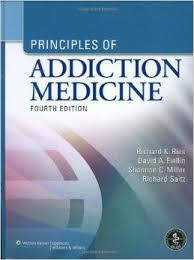 Journal of addictive diseases. 2005;24(1):13-23. Grenny J. Crucial conversations: the most potent force for eliminating disruptive behavior. Physician executive. Nov-Dec 2009;35(6):30-33. Huff DJ, Cline LE. 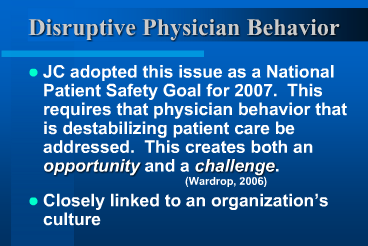 Another reason to be on your best behavior: the Joint Commission’s new disruptive physician standard. Journal of the Medical Association of Georgia. 2009;98(2):17-18. Leiker M. Sentinel events, disruptive behavior, and medical staff codes of conduct. WMJ : official publication of the State Medical Society of Wisconsin. Sep 2009;108(6):333-334. Although there was a general belief in witches at the time theas published they were not regarded as evil or life threatening. Society did not fear them and Church and Political authority certainly did not feel the need to hunt them down. There were many scholars who publicly doubted the existence of witches at the time. That would soon change. After being snubbed by secular and ecclesiastical authorities in his witch-hunting pursuits, the Dominican friar and German Inquisitor Heinrich Kramer told Pope Innocent VIII of a dangerous outbreak of witches that had occurred in the region. This diabolical conspiracy hell-bent on destroying humanity needed to be identified and destroyed for the public good, but church authorities were not cooperating. On December 5th, 1484 Pope Innocent VIII issued the papal bull Summis Desiderantes affectibus giving full authority to proceed with “correcting, imprisoning, punishing, and chastising” such persons “according to their deserts,” and threatening to sanction or excommunicate those who hindered the pursuit. The costs of a witch trial were usually paid for by the estate of the accused or their family. Far from the conventional image of a penniless hag, a significant proportion of accused witches, especially in Germany, were wealthy and male. Their property was seized to pay the clergymen, judges, physicians, torturers, guards, scribes, and laborers who raked in increasingly large sums of money as well as other reliable assets. With a single member accused, a moderately wealthy family could be ruined permanently. Wretched creatures are compelled by the severity of the torture to confess things they have never done and so by cruel butchery innocent lives are taken; and by new alchemy, gold and silver are coined from human blood. Your comparison of the assessment of “disruptive behavior” to that of the great witch purge is right on target. 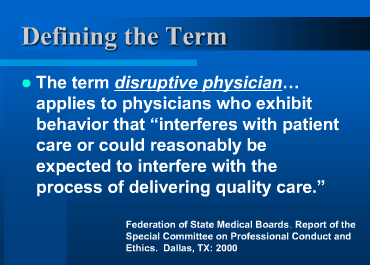 While there are indeed “disruptive docs” out there (in the original ‘dysfunctional’ and ‘counterproductive’ senses of the word), the potential for abuse of the term is immense. 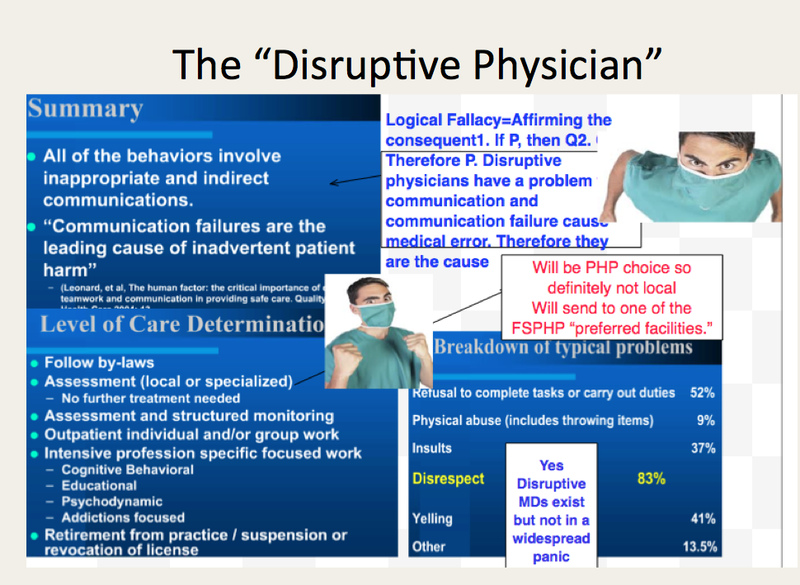 Consequently, anyone who doesn’t go along with the party (or prevailing authority) line can easily be characterized as a “disruptive doc.” With the current reign of PHPs determining the “assessment” of such docs, and the known denial of due process in arriving at that designation, either at the medical staff or PHP level, the potential for severe and life-altering abuse is profound. As with your detailed analysis of the history and evolution of the PHP movement, this exploration of the “disruptive physician” is excellent.